Virtual Routing/Forwarding (VRF) is an routing instance we set on PE router for each customer. It’s a dedicated routing table for particular customer, separated VRF CEF and associated routing protocols. Interface on PE router can belong only to one VRF. As mentioned in previous post RD is an identifier to distinguish same prefix from different customers and is used to create vpnv4 prefix. RD is 64-bit long. One RD must be define for each VRF but does not identify the VRF – in complex VPN scenarios more than one RD and appropriate policies could to be used. RD usually have format ASN:nn where nn is a number. RDs are nice but not enough to provide flexible policy, especially to create extranets. Route targets (RT) are controlling communication between sites. It’s an extended BGP community that indicates which routes should be imported from MP-BGP into the VRF. There are two operations connected with RDs. Exporting means that extended community is attached to vpnv4 prefix as configured in VRF. Importing means that extended community attached to prefix received from MP-BGP is checked for matching RT. If the match is positive then prefix is inserted into particular VRF routing table. For fully isolated VPN import and export RT must be same as defined RD for this VRF. This configuration have to be done only on PE routers that have customers using articular VPN. Let’s focus on VRF_B customer – his CE routers are connected to R3 adn R8 PE routers. Therefor our third PE router, R5, does not need any information about this VPN. The configuration on PE routers is as simple. We used same RD for both PE routers. Can we use different? Yes, but more complex RT policies have to be then defined. But using different RDs is a way to filter prefixes between sites. There are few ways to distribute prefixes between PE and CE routers including static routes. In this scenario we use BGP. CE router is not MPLS-aware. 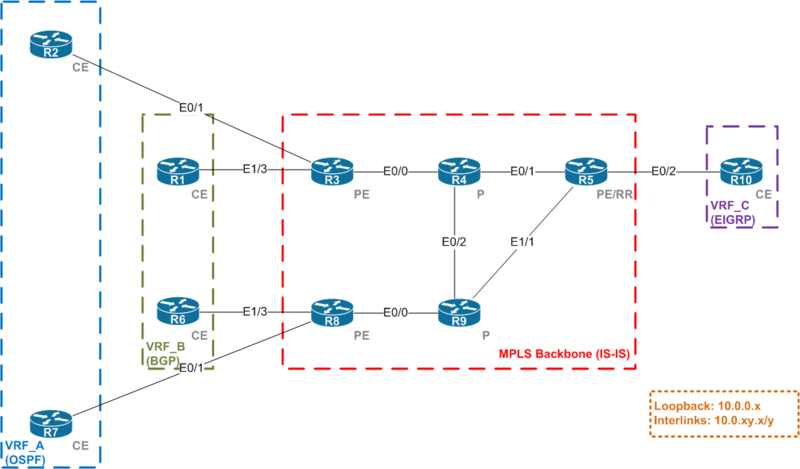 This simplifies things because our customers don’t have to have any knowledge about MPLS. From CE side it’s just BGP that have to be configured. We use the following configuration. We are going to advertise loopback interfaces of CE routers. All other configuration is pretty simple except maybe one thing. We used same AS number for R1 and R6. So R1 will send it’s loopback prefix 10.0.0.1/32 with AS_PATH of 65001. This prefix will be advertised by R8 to R6 with AS_PATH of 65111 65001. By default R6 will drop this prefix because it’s own AS number is already in AS_PATH so it suspects loop. There are two solutions of this problem. First is to use different AS number for each CE router. Some administrators do this but in my opinion is not really flexible especially in large networks with many customers. Second option is to use allowas-in option. This let BGP accept prefixes with own AS number in AS_PATH on eBGP session. As a parameter maximum occurrence of own AS number can be set. Now lets focus on PE routers. To connect session with particular VRF we have to put in under appropriate address-family. All other configuration is same as for global table. We can also troubleshoot path from R6 do R1 using traceroute command. This also gives us additional information how labels changes between routers. You have another option is to use BGP as-override on the PEs instead of allowas-in on CEs. And with BGP as the PE-CE protocol you can have the case where there is a backdoor link on CE Side, so to prevent from looping or suboptimal routing you can use the BGP SOO extended community. Great set of posts, very informative, thank you very much! what about the case where on one side with PE-CE connected through IBGP (same AS) and the other side with BGP?